Get our new personalized Good Sportsmanship book for your good sport today! Each book costs $14.99 ($9.99 plus $5.00 for shipping and handling). It takes about 48 hours to create your book and you can expect delivery approximately a week after that. While our books are available on Amazon and Barnes and Noble, this is a special order item you order here on the website. (Coming very soon you will have the chance to include any of our other books on the order page if you would like to do your shopping in one place but unfortunately not at this time.) Simply provide the requested information and we'll take care of the rest. ​​We've also developed our Good Sportsmanship Journal for Soccer. One of the best ways to learn something is to write it down. That's how the journal can help your new player understand how good sportsmanship is an important part of practice and game. Plenty of journal pages with helpful pointers are included to take notes about what's experienced. ​Our generic sports version is coming soon. Do you have little athletes in your family? Then this colorful book is a great way to help them understand what it means - and how important it is - to be a Good Sport.They'll learn easy sports manners as they read about familiar situations featuring kids just like them. Parents, you'll find handy reminders for you, too - so the whole family can learn to be Good Sports together. Looking for a fun way to help your children learn table manners? 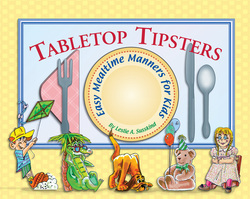 The characters on the placemats in "Tabletop Tipsters" make it easy. Your children will love learning how to act at the table by seeing what Bailey Puppydog, Sammy Gator, Katie Doll, Danny and Teddy Birthday Bear do -- before, during and after meals. Part story book, part practice book, all parts fun! Children will learn about good manners -- and how to tell time -- with this colorful, engaging book. They'll spend the day with Torie, Tad, Tessa and Tyler and discover how it's time for good manners all day long. And then they'll get the chance to practice telling time -- all while enjoying the cute clock designs, and without realizing they're learning!